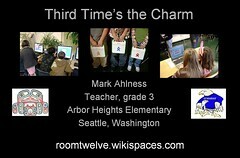 On February 28, 2008 I presented a one hour concurrent session, Third Time's the Charm - at NCCE in Seattle, WA. Here's how it went. So I just talked. I had been over this enough in my mind and with notes, so it was really a breeze. Then came the risky part. I checked my email in the middle of the preso to see if my kids had sent in any blog articles to be published. Bingo! 25 emails were there, waiting for me to approve articles to my third graders' blogs. So we went on. We went over a few of them live, looking at the emails, navigating the back end of classblogmeister, the whole works. People asked a fair number of questions along the way, which was great. I had to cut some things short. I never thought I'd run out of time. In the hurry to wrap it up, I forgot to ask if anybody had the answer to the bird quiz. I also forgot to start my mp3 recorder - I was going to use some of it in a podcast - darn!! Unfortunately, my eyes are not good enough to see the birds. Congrats on your presentation! It's scary to depend on technology in an unknown situation, but it sounds like it went well...and you made your commitment toward the grant as well.